Shareholders’ equity which is also known as owner’s equity is part of the balance sheet of a company. Shareholders’ equity is calculated by the difference between the assets and liabilities of a company. The components of Shareholders’ equity are contributed capital, preferred stock, treasury stock, retained earnings, noncontrolling or minority interest and accumulated other comprehensive income. 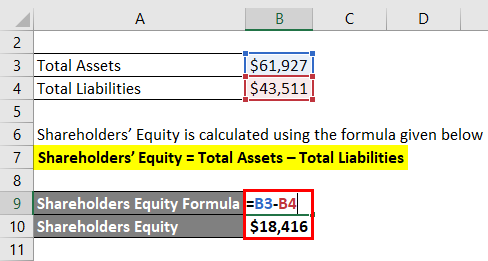 Let’s take an example to understand the calculation of Shareholders’ Equity formula in a better manner. Let us try to calculate the Shareholders’ equity with the help of an arbitrary example say for company A. 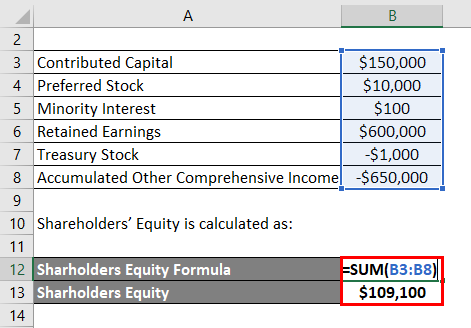 Shareholders capital can be calculated in two ways one of them is the accounting equation and the other is summing up all the components of shareholders equity. Both the way of calculating the shareholders’ equity of a company will provide the same result. The important components of the shareholders’ equity are presented in the table below. We can see that the summation of all the components for company A is $109,100, which the total owners equity of the company. Let us try to calculate the Shareholders’ equity with the help of United States steel corporations reported balance sheet. The accounting equation for the company United States steel corporations is presented in the table below. The total shareholders’ equity for the company is $3,942 million. Shareholders equity can also be calculated by the components of owner’s equity. The important components of the shareholders’ equity are presented in the Snapshot below. The common stock is the initial paid-up capital for the company. Treasury stock for the company is the amount stock bought back by the company and is no more part of the outstanding shares. The retained earnings are the part of the earning not distributed by the company and are reported in the owners’ section of the company as accumulated retained earnings. 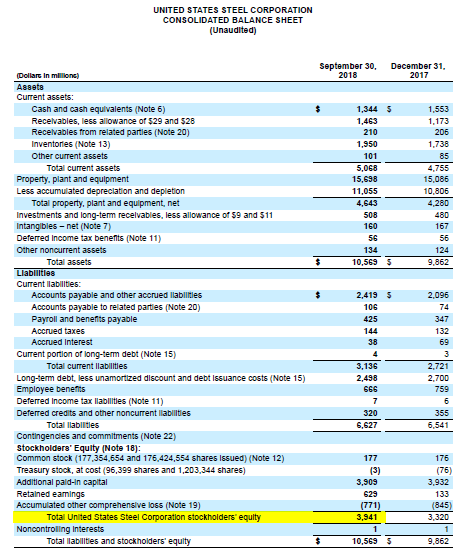 We can see that the summation of all the components for the company United States steel corporations is $3,941, which is the total owners’ equity of the company. From the example above we can see that both the way of calculating the shareholders’ equity of the company provides the same result. The calculation for Shareholders’ equity for the company is also presented in the excel sheet attached. Let us try to calculate the Shareholders’ equity with the help of Honeywell reported balance sheet. The total shareholders’ equity for the company is $18,416 million. Shareholders equity can also be calculated by the components of owner’s equity. The important components of the shareholders’ equity are presented in the Snapshot below. The common stock is the initial paid-up capital for the company. Treasury stock for the company is the amount stock bought back by the company and is no more part of the outstanding shares. The retained earnings are the part of the earning not distributed by the company and are reported in the owners’ section of the company as accumulated retained earnings. 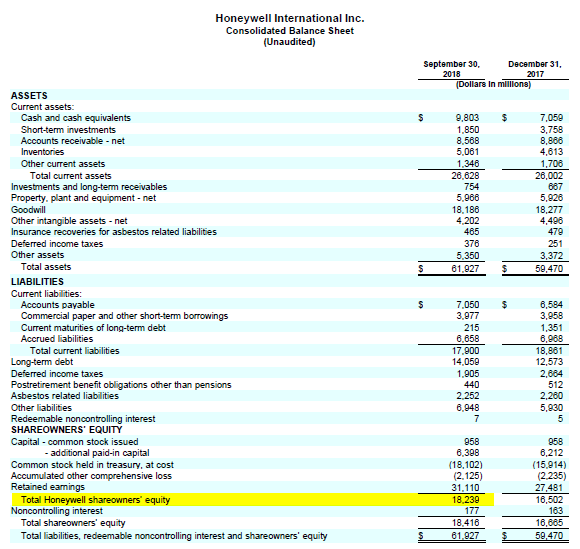 We can see that the summation of all the components for the company Honeywell is $18,416, which is the total owner’s equity of the company. Shareholders equity or the owner’s equity is the residual of total assets and total liabilities for a company. The company reports the components and the total of the owner’s equity in its quarterly or annual fillings. Shareholders equity includes initial paid-up capital, a share of the preferential shares issued by the company. It also includes the earnings that are retained the company after paying for the dividends and share buybacks. 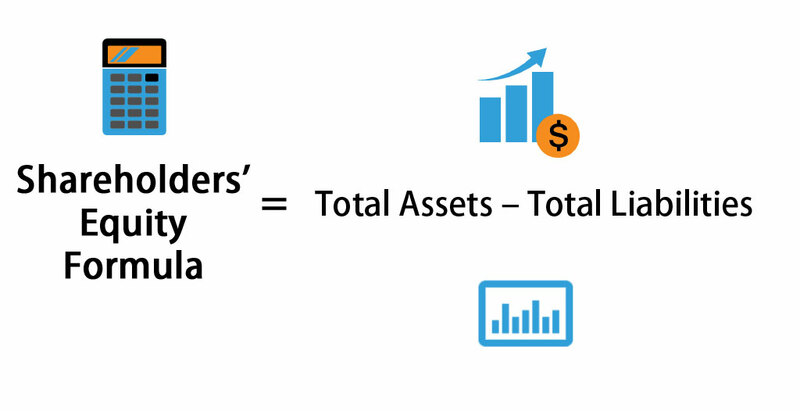 The summation of all these components of shareholders equity gives us the total shareholders fund of a company. There are two sources of fund for a company in order to set up by the business and expand the business. One of them is the shareholders’ equity. This is that part of the funding which is contributed by the owners of the company, initial in the form of the paid-up capital. Owner’s equity is very important as it contains the residual income of the business which it generates through the normal course of operating activities of the business. Equity the owners own money into the business and the owner does not owe to the creditors anything from this portion. With higher owners equity the business has the flexibility to pay dividends, buy back shares, pay interest, pay the principal of debt borrowings and also pay for an expansion of the companies. 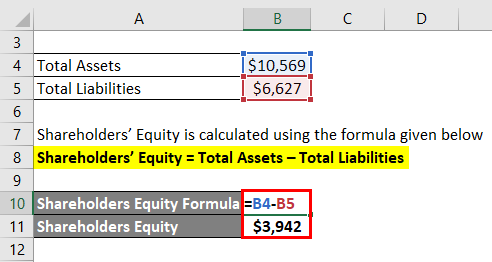 How to Calculate Return On Average Equity using Formula?